Is it possible to be addicted to music? I have no idea, but it feels like I am. I’ve been having sooo much fun over the past few weeks playing shows of all different shapes and sizes, writing, recording and generally making noise… It doesn’t look like I’ll be stopping anytime soon if I can help it, although the turkey dinner my sister’s got planned for Christmas may slow me down some. For a sneak peek of what is to come, I’m playing a set at The Lass O’Gowrie in Manchester on 7th Nov accompanied by my band, so get yourselves down there for a FREE GIG!!! The night kicks off at 8pm but I’ll be on after 9pm. Can’t wait to see you all there!!! After an epic summer tour in Lithuania, I’m finally getting out there again with the band on home soil. We had such a great time playing all four venues. Kind of got a taste for what I want to do… FOREVER! It’s strange how even when you’re away from familiar things, music still makes sense. You can be anywhere at all and the sound of a melody, or the underbelly of a bassy track will just bring you right back to being yourself again. I LOVE that feeling, that energy… It’s awesome. Next show is at Blue Cat Cafe on Monday 22nd October. Bring it!! 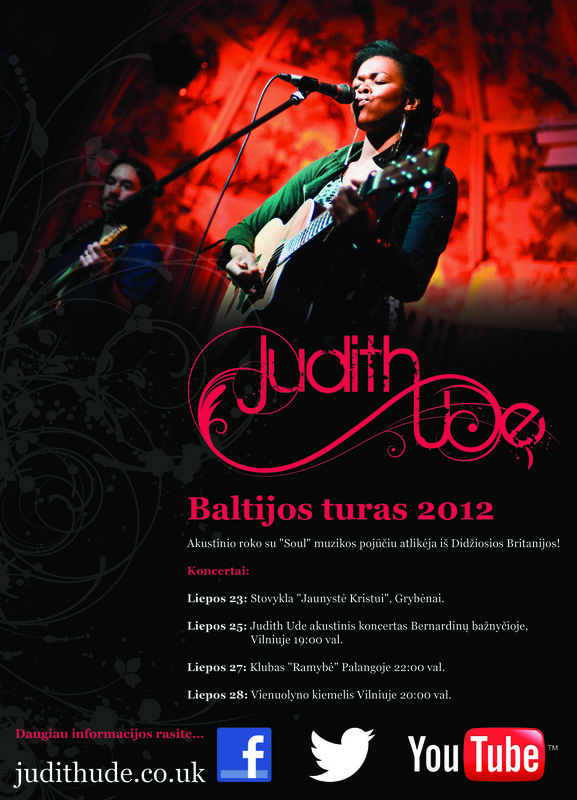 JUDITH UDE – The Baltic Tour! 20th – 30th July 2012: It’s Time….